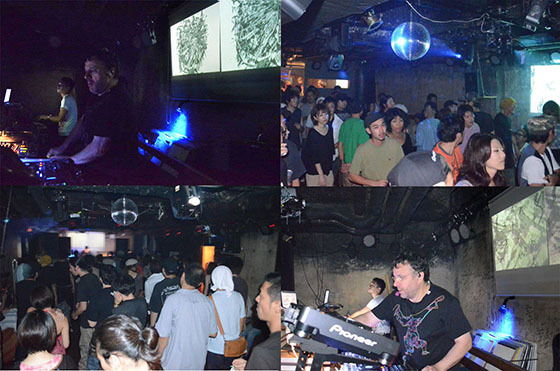 5 years ago, a while after the Great East Japan Earthquake and when local parties started again, when FRANCOIS K. played at a club in Sendai, I participated as VJ. Right after the Earthquake all I did is to send donation, I couldn't manage my schedule to visit local area to help them with doing reconstruction, at that time with the feeling of reconstruction I wanted to cheer people up as Artwork Collaboration VJ. Collaboration with Tomozo happened only in Sendai ADD with the exception of Tokyo. Currently ADD is inactive, but for long years ADD has been a club represents Tohoku and many DJs and musicians has played there, its also really well-made facility. I appreciate Kase from ADD who took care of me at the time, and Chubachi who coordinated everything. Also, I hope place to send out good music to grow as well as the reconstruction. I still remember the landscape of areas affected by the earthquake after finishing the party.